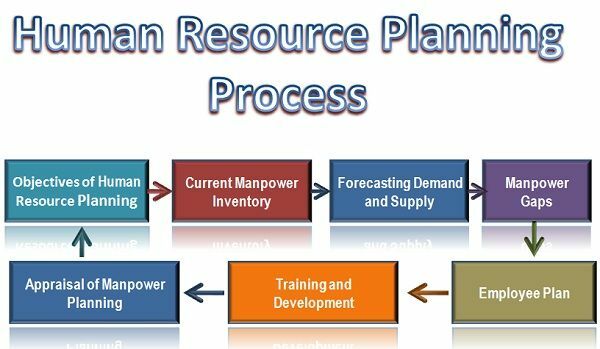 The Human Resource Planning is a process of forecasting the organization’s demand for and supply of manpower needs in the near future. Determining the Objectives of Human Resource Planning: The foremost step in every process is the determination of the objectives for which the process is to be carried on. The objective for which the manpower planning is to be done should be defined precisely, so as to ensure that a right number of people for the right kind of job are selected. The objectives can vary across the several departments in the organization such as the personnel demand may differ in marketing, finance, production, HR department, based on their roles or functions. Analyzing Current Manpower Inventory: The next step is to analyze the current manpower supply in the organization through the stored information about the employees in terms of their experience, proficiency, skills, etc. required to perform a particular job. Also, the future vacancies can be estimated, so as to plan for the manpower from both the internal (within the current employees) and the external (hiring candidates from outside) sources. Thus, it is to be ensured that reservoir of talent is maintained to meet any vacancy arising in the near future. Forecasting Demand and Supply of Human Resources: Once the inventory of talented manpower is maintained; the next step is to match the demand for the manpower arising in the future with the supply or available resources with the organization. Here, the required skills of personnel for a particular job are matched with the job description and specification. Analyzing the Manpower Gaps: After forecasting the demand and supply, the manpower gaps can be easily evaluated. In case the demand is more than the supply of human resources, that means there is a deficit, and thus, new candidates are to be hired. Whereas, if the Demand is less than supply, there arises a surplus in the human resources, and hence, the employees have to be removed either in the form of termination, retirement, layoff, transfer, etc. Employment Plan/Action Plan: Once the manpower gaps are evaluated, the action plan is to be formulated accordingly. In a case of a deficit, the firm may go either for recruitment, training, interdepartmental transfer plans whereas in the case of a surplus, the voluntary retirement schemes, redeployment, transfer, layoff, could be followed. Training and Development: The training is not only for the new joinees but also for the existing employees who are required to update their skills from time to time. After the employment plan, the training programmes are conducted to equip the new employees as well as the old ones with the requisite skills to be performed on a particular job. Appraisal of Manpower Planning: Finally, the effectiveness of the manpower planning process is to be evaluated. Here the human resource plan is compared with its actual implementation to ensure the availability of a number of employees for several jobs. At this stage, the firm has to decide the success of the plan and control the deficiencies, if any. Thus, human resource planning is a continuous process that begins with the objectives of Human Resource planning and ends with the appraisal or feedback and control of the planning process. It’s really excellent site and I am so happy of reading HR in this. It’s very crisp and clear and I found it very very useful. Thank you very much for this kind of sites. Thank you for providing such truly information about Human Resource Planning Process.